Built in 1762, Thomas Cresap with his 20-year-old son Michael built this house. Michael died 13 years later, but Thomas lived into his nineties. The house is one of the only remnants of the frontier the Cresap family built in Oldtown. Reverend John Jacobs, who married Michael Cresap’s widow, built the brick addition in 1871. The low water crossing at Oldtown near the house site meant the area saw action during the Civil War. On August 2, 1864, the Confederates attempted to cross the Potomac but found Union troops blocking the way. Not willing to be deterred, the Confederates forced their way across the river, causing the Northerners to seek refuge in a blockhouse at the B&O railroad station. However, Confederates fired at the train’s engine, causing an explosion that forced Union troops to abandon the train. Battle waged for several more hours but eventually the Northerners surrendered. 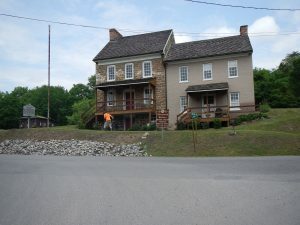 As the oldest surviving building in Allegeny County, the Michael Cresap House is listed on the National Register of Historic Places and maintained as a local museum with occasional hours. Call for an appointment.